Anti-Flag in Montreal or Quebec City? Inform me about the next events for Anti-Flag. Enroll yourself to our priority waiting list for Anti-Flag to be alerted when new tickets are available. Filling this form doesn't engage you to any purchase. Anti-Flag will be back in Montreal on September 24th, 2010. The American punk band will be performing at Studio Juste Pour Rire. 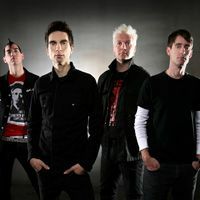 In over 20 years, Anti-Flag have released nearly 20 albums, including the latest, The People or the Gun, which was launched in July of 2009.